Greetings friends and fellow crafters. Today I want to bring to you a Christmas card made for a couple of design team calls going on right now. This card is a double embossed technique. First I used embossing paste and a Folk Art stencil. 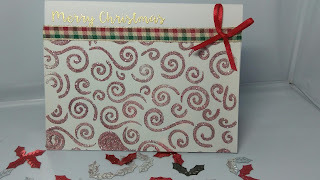 Once I had the embossing paste on, I used WOW embossing powder and covered the embossing paste. I then used my heat tool to help it set. Using Versamark I then stamped the Merry Christmas sentiment and heat embossed with gold embossing powder. Added a strip of ribbon and a bow from my stash and my CAS Christmas card was complete. I hope you like my project and I will be back in a few days with a new project. Pretty card; love the plaid ribbon! Thanks for playing along with us at CC&S! Very festive! Thanks for making CC&S part of your crafting fun.